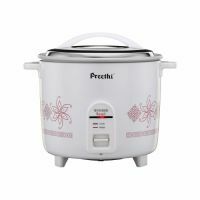 This preethi rice cooker has capacity of 1.8 litre. It has double protection thermal fuse and micro switch are interlinked to protect the rice cooker from power fluctuation. This rice cooker comes with all round protection which ensures safety from moisture, water seepage and makes the warm heater fail proof. 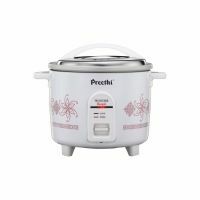 The preethi rice cooker can cook wide range of foods starting from palav, biryani, halwa, and payasam to gravies like sambhar, rasam etc. It comes with RoHS compliant product and completely made up of eco-friendly materials. To Recieve updates and possible rewards for Preethi Rangoli 1.8 Litre please sign in. To Recieve updates and possible rewards for Electric Rice Cooker please sign in.